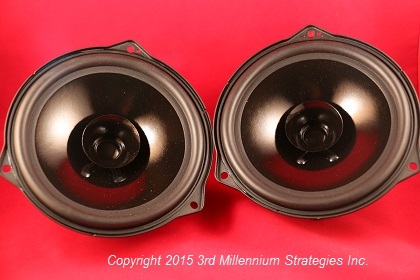 Affordable and great sounding direct-fit speakers are now available for your 1990 - 2015 Miata! 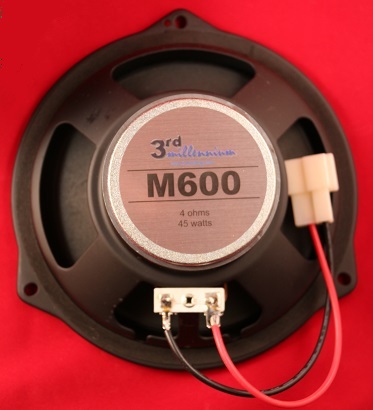 Over a year in the making, let us introduce you to our M600 door speakers! Available exclusively from 3rd Millennium, the M600's are an exact fit for the 1990-1997 doors (1999-2015 Miata's require our AD1 Mounting Kit - select bundle below. Not compatible with 2009-2015 Bose radio/amps). The M600's just screw into place with no drilling, cutting, or modification of your Miata. We've even manufactured the M600 with a special harness adapter so they just plug in to your existing door wiring. It's plug and play! And the sound is a huge improvement over stock. We designed the M600 (and their high-end big brother, the M800) specifically for the Miata doors. The M600 features a large magnet structure, a butyl rubber surround, and a polymer treated cone for deep, warm bass response. And with a substantial 45 watts per speaker capacity, the M600s not only work great with stock stereos, but are ready for aftermarket amps. Installation literally takes minutes and only requires a screwdriver as the M600s are an exact fit and use the existing speaker screw holes. And with our included harness adapter, you simply plug them in to the stock factory wiring. There's no splicing, soldering, crimping, drilling, or struggling to install. If you unsure about installing them, check out our video of an actual installation here. Much larger magnets than the original factory speakers and are rated to handle a larger 45 watts of full-frequency power each compared to the oem speaker's 25 watts. Polymer impregnated cones. This treatment helps resist moisture - important in a convertible (we've all been caught in the rain a few times!). The added stiffness also improves transient response and performance. Butyl rubber surround. The oem and most cheap replacement speakers fail because the paper or foam surrounds rot away. With the M600s, the paper surround has been replaced with a high-compliance butyl rubber surround. This not only makes them moisture resistant, but also greatly increases the bass response - something most Miata's have never experienced. The frequency response is an impressively flat 60 - 15,000 Hz +-5dB. The impedance is 4 ohms - just like stock. Note that if you have a 1999-2015 Miata, you will need to select our bundle that includes our AD1 Mounting Kit which gives you a plug and play install. The bundle features a special reduced price over purchasing the speaker and AD1 kit separately. Optional Rainshields: Especially in the 1st and 2nd Generation Miata's, if your door window belt molding is worn and leaky, a lot of water gets into the doors. 2006-2015 Miata's have much less of a problem with water in the doors because of the way the inner door assembly is constructed. The XTC65 baffles are an economical and simple way to protect your speakers. Just cut out the lower half and install. Watch our video to learn more. Add to your order below. Bose info: Because these are standard 4-ohm speakers, they are not directly compatible with Bose radios/amplifiers. 1999-2008 Miata's with a Bose radio/amp can use the M600s but will experience reduced maximum output due to the M600s being a 4-ohm impedence compared to the Bose 1-ohm. But most users report the volume levels achieved still more than adequate. And with the Bose system, you will also want to disconnect the stock Bose tweeter. It's 4-ohm but overly hot and since the M600s are already a full frequency design, the stock tweeter is best left disconnected. Our M800/M600's will physically fit perfectly in the 2009-2015 Miata doors with stock Bose speakers, but operation will not be correct with the stock Bose amp as during these model years Mazda/Bose built the crossover into the amp itself so that the door woofer and tweeter are fed frequency-limited signals. But with either an NB or NC, if the Bose radio/amp have been replaced with a normal head unit and/or amp of any make, our M600/M800's will fit perfectly in the doors regardless of the factory speaker setup. When you order you will receive (2) brand new M600 speakers. We offer a 30-day 'no questions asked' money back guarantee and a full 1-year warranty. Still have questions? Drop us a note. Priority Mail Shipping $12.85 or less for most items in the U.S.
"The M600 door speakers went in perfect......WHAT A DIFFERENCE!!!!" Tim, Florida"
"WOW! Received the M600 speakers today. Got them installed in my '07 NC in about 1 1/2 hours(getting the door cards out mostly). I left the tweeters unplugged as suggested. All I can say is WOW! I balanced them with the windscreen speakers and went for a top down ride at sunset. The M600 speakers truly are a fantastic value and enhancement to the stock non-Bose radio. Sammy Hagar's "I Can't Drive 55" sounded awesome! Thank you for making the Miata that much more fun to drive." Mike K., Tampa FL"
Shipping in the US is via Priority Mail or UPS Ground for large orders. Priority Mail offers a 2-3 day delivery, a history of safe handling and delivery, and full package tracking. International orders are welcome! We cheerfully ship anywhere in the world via US Postal Service First Class International service which features a 5-10 day delivery time for weights up to 4 lbs total. Please note that any duties or taxes assessed by your country's customs authorities are your responsibility. To see shipping charges to your location, add your items to the shopping cart and then select your zip code or country. We do not mark up shipping charges! Easy Install! Watch the video!